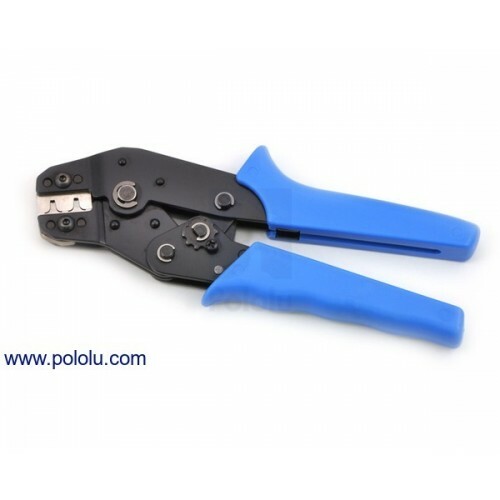 Note: This crimping tool is 3 mm narrower than our more versatile 0.1-1.0 mm² capacity crimper, and it does not crimp the full extent of the wire barrel on the JR, Futaba J, and 0.1" housing crimp pins (see the picture at the bottom of this page). 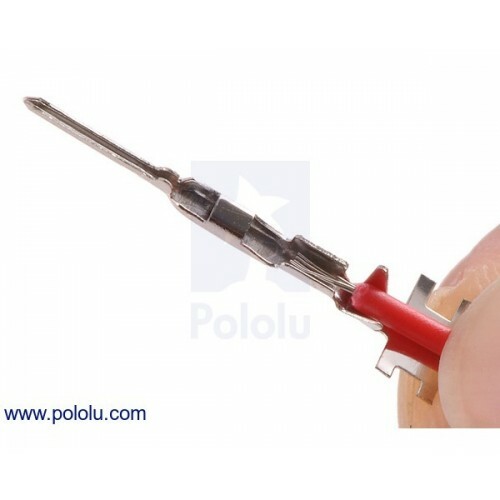 It still makes a sufficient electrical connection between the crimp pin and the wire conductors, however, and the uncrimped portion of the wire barrel will be fully concealed by the connector housing. Prepare the wire by stripping about 1/8" (3 mm) of insulation from the end. Place the wire in the crimp pin, lining it up so that the stripped portion lies between the inner set of tabs on the crimp pin, while insulated wire lies between the outer set of tabs. Place the wire and crimp pin on the appropriate tooth of the tool’s die, making sure that the insulated end is on the raised and wider half of the tooth. The tabs should point toward the cavity on the other side of the die so that the tool bends them inward around the wire when it closes. 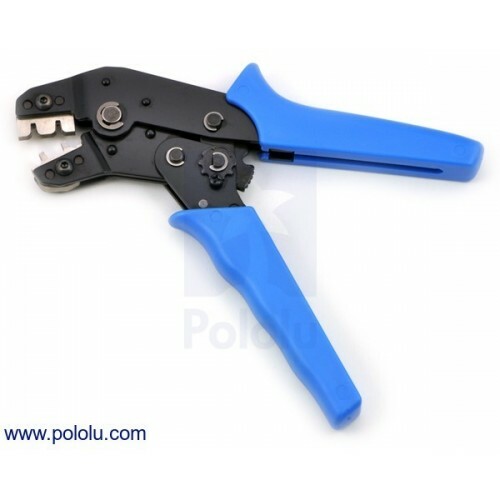 The picture below shows our more versatile crimping tool, but the procedure is the same for this crimper. Close the jaws of the tool slowly and completely until they release. The tabs on a properly crimped pin should form one barrel around the wire conductors and another barrel for strain relief around the wire insulation. 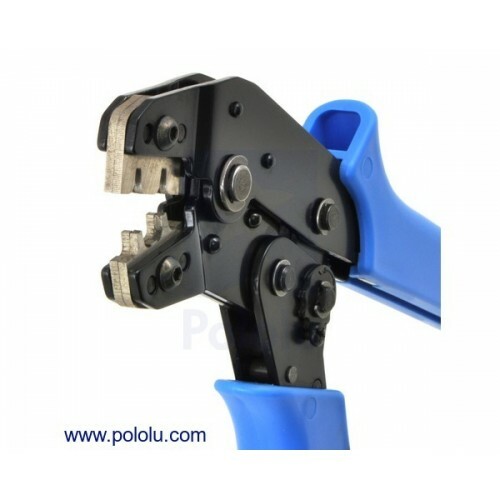 When using this narrower crimper on the JR, Futaba J, and 0.1" housing crimp pins, only part of the wire barrel gets crimped, but it is still enough to make a sufficient electrical connection to the wire conductors, and the uncrimped portion of the wire barrel will be concealed by the crimp pin housing. This tool is wide enough to crimp the full wire barrel of the JST RCY crimp pins. Tip: The strain relief barrel sometimes ends up a little overly flattened, making it too wide to fit comfortably into the crimp pin housing. In such situations, you can use a pair of pliers to gently squeeze the wider axis of the barrel into a more cylindrical shape that will slide easily into the housing.